Habit: Shrub, tree. stipule spines generally 2 per node; roots long, spreading. Leaf: even-2-pinnate, alternate, deciduous; 1° leaflets generally 2--4, opposite; 2° leaflets generally many, opposite. Inflorescence: axillary, head or spike-like raceme, many-flowered. Flower: radial, small, green-white or yellow; calyx shallowly bell-shaped, lobes short; petals generally inconspicuous; stamens 10, exserted, free; style exserted, generally appearing before stamens. Fruit: indehiscent, +- flat, +- narrowed between seeds or tightly coiled, pulpy when young, then woody. Seed: several. Species In Genus: +- 44 species: especially America (also southwestern Asia, northern Africa). Etymology: (Greek: burdock, for obscure reasons) Note: Cult, naturalized worldwide. Prosopis glandulosa Torr. var. torreyana (L.D. Benson) M.C. Johnst. Habit: Shrub, tree < 7 m; crown often wider than tall. Stem: branches arched, crooked; spines 5--40 mm. Leaf: glabrous; 1° leaflets generally 1 pair, 6--17 cm; 2° leaflets 14--34, (10)15--25 mm, oblong, length 7--9 × width. Inflorescence: spike-like raceme, 6--10 cm. Flower: petals 2.5--3.5 mm. Fruit: 5--20 cm, linear, +- narrowed between seeds, glabrous. Seed: generally 5--18, 6--7 mm, oblong. 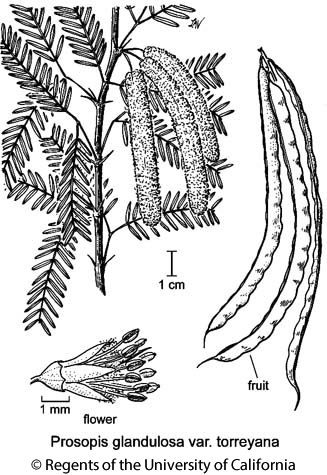 Citation for this treatment: Martin F. Wojciechowski & Elizabeth McClintock 2012, Prosopis glandulosa var. torreyana, in Jepson Flora Project (eds.) Jepson eFlora, http://ucjeps.berkeley.edu/eflora/eflora_display.php?tid=64489, accessed on April 24, 2019. SnJV, SCo, SnGb, SnBr, PR, D; Markers link to CCH specimen records. Yellow markers indicate records that may provide evidence for eFlora range revision or may have georeferencing or identification issues. Purple markers indicate specimens collected from a garden, greenhouse, or other non-wild location.